Do you or someone you love have an addiction that is causing you pain emotionally or physically? Is it difficult to identify where the problem came from let alone fix it? I can work with you to help you understand the addiction in terms of what drives it in you. This will help you to both manage it and predict when the addictive urge may come up, which will help you head it off before it happens. Nothing influences humans more than what we link to pain and pleasure. It’s a survival instinct to move away from pain and toward pleasure. This means our brains can get wired in ways that we consciously know are not good for us, but we still have difficulty quitting the addiction. The root causes of most addiction problems are the need to fill an inner emptiness of not feeling good enough and/or the need for connection. Do you ever find yourself saying, “I want to be slimmer, but I can't give up my cake." "I want to be calmer, but my work schedule won't allow it." "I want to be smoke free, but I can't give up cigarettes." "I want to be loved, but I don't want to give up my freedom or independence." Reasons or excuses get old and pretty soon years can go by without making a change. Once there is acceptance of having a problem and commitment to fix it, then I can use hypnotherapy to help you change thought processes at the subconscious level of the mind and subsequently change the addictive behaviour. Do you suffer from hair loss? Do you have a problem with baldness? Close your eyes and imagine what you look like now and then what you could look like with more hair. How do you feel? Stronger, more powerful, younger? These are the words that Francesco used to describe his transformation before and after a session of Rapid Transformational Therapy (RTT). 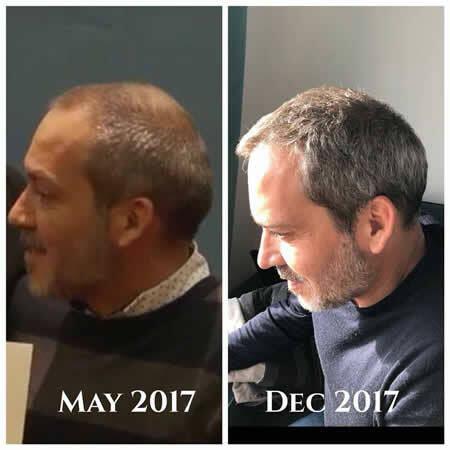 You can see a difference in his hair growth within six months of one Rapid Transformational Therapy session. As an hypnotherapist, I’ve worked with many types of issues that people have suffered with for a long time. If your hair is falling out and nothing else has worked for you, then try a session with me. I use a hybrid of all the best things out there: psychology, Neuro-Linguistic Programming, hypnosis, hypnotherapy, and more. If it worked for Francesco, then why not you? Sleep is nature’s way of restoring the body and mind. If you are having trouble sleeping, then it is the sign of a troubled mind. If you get into bed and your mind is has difficulty switching off, then hypnotherapy can find the root cause of the problem and help you let it go for good. When you sleep better, you’ll work better and be a whole lot nicer to be around. Hypnotherapy is said to be the most effective way of giving up smoking with a 90.6% success rate according to University of Washington School of Medicine, Dept. of Anesthesiology and Rehabilitation Medicine, in the 2010 July issue of International Journal of Clinical Experimental Hypnosis, 49(3), 257-66. The choice is yours. You can live your life with the smell, cough, phlegm and colds that often go with smoking. Spending your hard earned money on something that is making you look older sooner while creating havoc on your health OR you can free yourself from the chains of cigarettes to live a more vibrant, healthy, strong life with more money to travel and achieve your dreams. You are at a fork in the road. Are you going to taste all that life has to offer? In the summer of 2018, it’s reported that it will be legal to smoke marijuana in Canada. Currently, the government is running a medical marijuana program and drawing up legislation for the process of legalization. But, before you start taking marijuana, you should be aware that there are also short-term side-effects to quitting if it becomes a habit. Irritability, anger, and insomnia can be experienced with intensity according to Johns Hopkins University School of Medicine and The American Journal of Psychiatry. Others say there are benefits to taking medical marijuana. Many studies have found it to minimize symptoms of things such as PTSD, chronic pain, and cancer treatments. However, if you want an alternative to drugs then consider hypnotherapy, which can also help you obtain greater peace of mind, pain relief or management.